RickBoyne.com: What Happened to "Free Air"? What Happened to "Free Air"? Remember when you could get air for free? No, not the breathing kind, but the fill your tires kind. 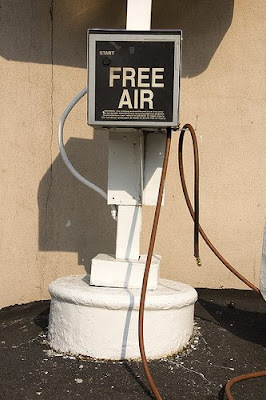 Before we went overseas, almost everyone who sold gas had free air. Now, you have to pay .75¢ just for the privilege of topping off your tire pressure. Gone are full-service stations. The last one in Wagoner closed last Christmas. Gone is service of any kind. People don't care anymore; except for making a buck. There is still a place in Vinita, OK, that has free air. God Bless Shout-N-Sack! Give a break! Give free air again! This is why they sing that song about the wind. It was all the free air! Oklahoma, where the wind comes sweeping down the plain. I'm with ya Rick! There is a chain of grocery stores here in Lubbock that offer free air at their gas station area. I was shocked when I realized it was free. Three cheers for free air! Did you know California has (I think it is still current!) a law about this? They are required to provide free air and water. They have a "charge" amount posted but if you go ask the attendant, they are supposed to give it to you - tokens, or whatever. This is IF you are a customer . . .
Aren't Quik Trips still free (air wise)? There is one station in my area that has free air...the others all charge...I refuse, unless it is an emergency to pay for air! There should be a law about it...Maybe Mr. Obama will do something about that...does anyone have his blackberry number? Michael, thanks for the support! Becky, I like THAT law! When I had an oil change/checkup a few weeks ago I asked that the air be checked. The young lad replied "Do you want air or nitrogen?" C O L D ! ! ! Two "Record Setting" Days in a Row! Be happy for this guy! What if the church were run like an airline? Office of the President Elect?